Posted on November 28, 2017 - By Fucosoft | Follow YouTube, Twitter to Get More Information. While traditional voice calls and SMS are now on the defensive, new IM applications have become a necessity of users. Among all these, WhatsApp and Viber are the most popular ones. No matter you are installing WhatsApp or Viber on your Android phone, you might be aware of the data loss problems. We’ve discussed WhatsApp Recovery for Android, and in this article, we will show you how to retrieve deleted Viber messages on Android. When encountered Viber messages loss, please don’t worry, you can try Fucosoft Android Data Recovery. This professional Android Viber recovery tool can help you recover deleted Viber messages on Android along with other data like WhatsApp, text messages, contacts, photos, videos, etc. without backup. Also, it works for all popular Android devices, including Samsung Galaxy S9/Note 9, HTC U12+, Huawei Mate 20 Pro, Google Pixel 3 XL, LG G7, OnePlus 6T, Sony, Moto, Xiaomi, Oppo, etc. Step 1. Download, install and run Fucosoft Android Viber Recovery tool on your computer. Enable USB debugging on your Android phone and then plug it into computer using a USB cable. Step 2. After connecting your phone, select the specified file types you want to recover and simply click “Next”. Then the program will scan the device for deleted files. Step 3. When the scan is complete, you can preview the recoverable Viber chats in details and then select out those you want. Finally, you can click “Recover” to save them on computer. Your Viber chat history means a lot to you, we strongly recommend you to regular backup Viber messages on Android with cloud service like Google Drive. Then you can easily restore Viber messages from Android when unexpected data loss happens. Open Viber on your Android phone and tap the more option icon. Scroll down to select “Settings” and then tap on “Viber Backup”. 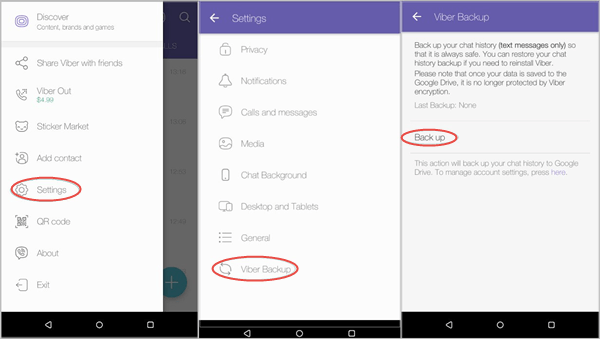 Choose “Back up” and wait while Viber backs up your chats and messages. Note: Please make sure that your Viber account has connected to your Google Drive before you can make the backup. If not, please tap on “Connect drive” and choose the Google account you want to save your Viber messages. On your Android phone, open Viber and tap the more option icon. Tap on “Settings” and choose “Account”, then select “Viber Backup”. 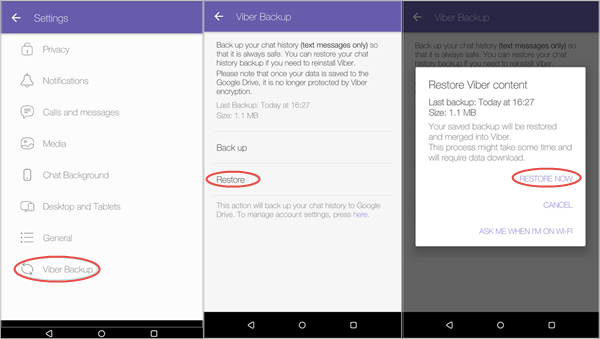 Tap on “Restore > Restore Now” to restore Viber messages to Android. Note: You can only restore your Viber messages to Android phone with the same phone number that used to make the backup.